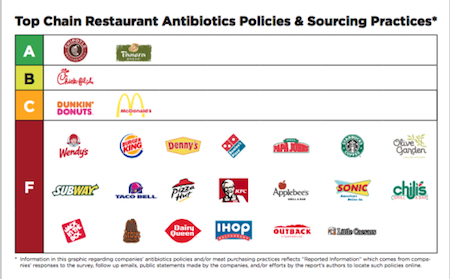 25 Fast Food Chains Ranked On Antibiotic Usage - See Who Gets The WORST Grades! TIME.com reports that antibiotic resistance is one of the top five health threats facing Americans, according to the US Centers for Disease Control and Prevention. More than 2 million people in the US get infections every year that are resistant to antibiotics, and around 23,000 people die from these infections. Contributing to that problem is the unrestricted use of antibiotics and animal rearing; drugs are used to fatten up livestock and prevent illness, and their routine application has contributed to the rise of so-called superbugs resistant to the drugs designed to kill them. Responding to public pressure, some major fast food chains and meat suppliers have pledged to use fewer antibiotics. And now, a new report analyzed the practices and policies of 25 of the largest fast food and fast casual restaurants in the US to see how companies were faring. The paper, authored by several public interest groups, gave each chain a letter grade based on the use of antibiotics – and their transparency about it. “Consumers should be as concerned as the foremost infectious disease doctors are – which is very concerned,” said Dr. David Wallinga, a senior health officer at the environmental nonprofit National Resource Defense Council, who contributed to the report. In the report card, only Panera and Chipotle received an “A”. The two companies both have a wide variety of meat offerings that do not use antibiotics. About 90% of the meat Chipotle sources is free of antibiotics. Panera says 100% of its chicken and pork is raised without antibiotics, as well as a third of its turkey. The company is still reviewing its beef policy: one of its beef suppliers does not use antibiotics, while another supplier only uses antibiotics when the animals are sick. Chick-fil-A follows with the lone “B” rating. It has policies limiting the use of antibiotics in its chicken, and has pledged to be 100% antibiotic free by 2019. In March 2015, the report says that 20% of Chick-fil-A’s chicken met the standard. McDonald’s and Dunkin’ Donuts were both given a “C”. While Dunkin’ Donuts says it has a policy limiting antibiotic use in its meat, it apparently does not have a timeline for meeting that goal. McDonald’s announced in 2015 that within two years, it would serve chicken that are only fed antibiotics when they are sick. Check out the list and see which fast food companies did not do so well, receiving an “F” rating overall. You might want to avoid these restaurants!